Sitting in a dentist’s chair, his mouth stinging from cavity drilling, Bret Malkin attempted to focus on campaign plans. 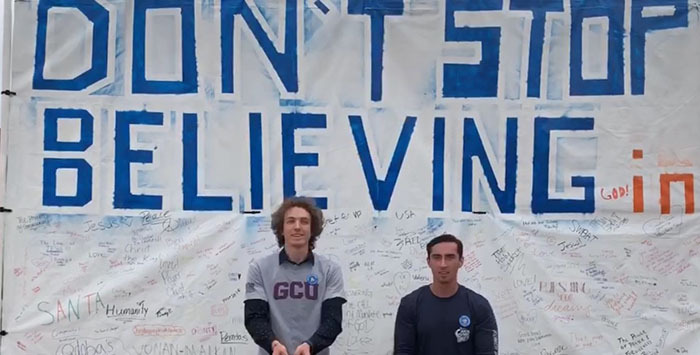 “I wanted to think of something other than my pain, so I started a brainstorming session about something interactive that would get our message across and also get student’s messages back to us,’’ said the Grand Canyon University junior from Scottsdale. Bret Malkin (standing), and GCU marketing students flash a Lopes Up toward the interactive billboard. Initially, he pictured students spray painting their messages on a giant graffiti wall. Then, he reasoned that it could get messy, the words wouldn’t be legible and they would take up too much space. Sharpies would be a better alternative. The initiative boosted the Samuel Yonan-Bret Malkin ticket over Jacob Montgomery–Anthony Clark in a vote of GCU students that was tallied late Friday night. Over the next few months, Yonan-Malkin will select their chief of staff and administrative vice president. They will be sworn in before the semester ends in April. In June, they will return to campus to begin planning for the 2019-2020 academic year. The messages on the billboard, which was displayed for 12 hours daily last week along Lopes Way, will give them a head start. A campaign poster parody of John C. Reilly’s and Will Ferrell’s 2008 “Step Brothers” film gave voters a laugh. 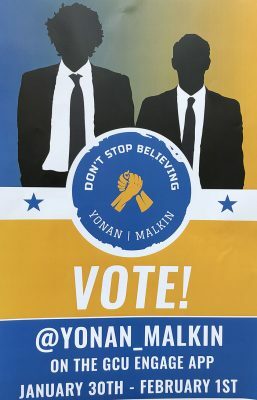 The energy was essential, since Yonan and Malkin manned a table, meeting, greeting and exchanging ideas with potential voters for hours on end. 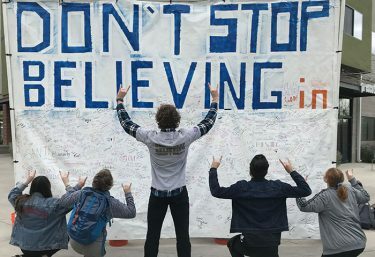 When they left the area outside Prescott Hall to attend their classes and buy their meals, their friends and supporters campaigned for them and supervised the billboard. Yonan, a government major with an emphasis in public policy, is minoring in Christian studies, and Malkin’s minor is Biblical studies. Together, they devised a plank on their platform to represent their faith and the Christian worldview of GCU. “We want to reach out and work with Spiritual Life to help give them the resources to reach out to students and help them connect to local church communities,” Yonan said. A proposed church fair through Spiritual Life would serve as a facilitator for students, particularly freshmen and transfers, to meet leaders of area churches to help determine which place of worship they would desire to attend. Plus, it would help with the organization of car pools to churches. 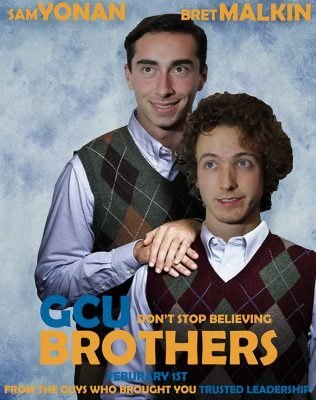 Another key plank was expanding the student representation of GCU by creating a House of Representatives within ASGCU. One member of each of the approximately 150 clubs would be represented in the HOR. “It would not only add diversity and improve communication, it would hold student leaders accountable,’’ said Yonan, a junior from Susanville, Calif., who is currently a member of the ASGCU Senate serving on the appropriations committee. This professional poster helped yield votes. From left, Bret Malkin and Samuel Yonan. Among their most practical ideas: expanding printing stations around campus, including the new Colangelo College of Business building and the Engineering and Technology buildings to reduce printing lines at the library. Several of their ideas were gleaned from the students after Yonan and Malkin distributed “palm’’ cards with their Instagram address, encouraging students to communicate via the social media platform.